Timeframe: Estimated at two (30-minute) sessions, 60 minutes total. In this activity, students will learn about the concept of context and why it is of crucial importance to study the environment and other circumstances surrounding folklife and traditional arts. Studying contexts also will help students understand how traditions begin, why they continue, and why they sometimes disappear. In Activity 2 of this lesson, students will learn more about the ways traditions pass from person to person and from generation to generation. Explore and discuss examples of context as applied to folklife and traditional arts. Compare and contrast two similar art forms from different cultures with special emphasis on their contexts. Purpose - the social purpose or need for which the particular visual folk art is created or performing folk art is performed. Example - In many parts of Mexico and in the United States, Mexican and Mexican American families celebrate El Dia de los Muertos, (the Day of the Dead) on the first two days of November. 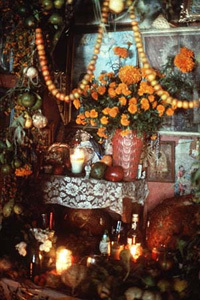 One of the traditions involved in this celebration is construction of beautiful and elaborate home altars decorated with religious items, pictures of deceased family members, food, drink, and flowers. Families have a need to honor and remember loved ones who have died. That is why they celebrate this holiday and construct these traditional altars. Many believe the spirits of ancestors come back during the holiday to celebrate with the living and the altars are a sign of welcome to these spirits. El Dia has roots in both the indigenous (native) religions of Mexico and in Christianity. Example - Eagle feathers are symbols of achievement, bravery, and sacrifice for many Native American tribes. Therefore, traditional dance regalia made with eagle feathers is treated with special care and respect. In most tribes, dancers must earn the right to wear eagle feathers. At some tribal powwows, dancers must pay a fine if their eagle feathers are allowed to touch or fall on the ground. When a feather falls in the dance arena, a special ceremony often is performed before the powwow dancing is allowed to resume. The number and type of eagle feathers worn by a dancer are significant and have special meaning for tribal members. Aesthetics - the cultural ideals of beauty, harmony, color, form, and mood that are displayed in the art form or other tradition. Example - The Hmong people from Southeast Asia are famous for their needlework. They use Paj Ntaub (means "flower cloth" in English) traditional needlework designs to decorate clothing, baby carriers, and other practical items. Traditionally, the Hmong always have favored bright, contrasting colors set against a dark background. However, when they started to create items especially to sell to American consumers, they added new, more subdued color combinations to suit American tastes. History - the history and continuity of the art within the folk group. Example - Custom saddles and tack (any of the various accessories such as bridles, halters, reins, bits, and harnesses worn by riding or draft horses) have been made in Nebraska for well over a century. Saddle and tack makers and repairers were much more numerous before the automobile was introduced, because most families on the Great Plains had to own one or more horses for transportation and for use in farm and ranch work. Nevertheless, there is still a need for both new gear and repairs on older saddles and tack, especially in Nebraska's central and western ranching country where horses are more numerous. The tradition is still alive in our state, carried on by a few custom saddle and tack makers who have learned techniques through apprenticeships, trade schools and, most importantly, directly from relatives and other older saddle and tack makers. Artist Preparation - the personal characteristics, knowledge, training and experience needed by the creator or performer of the art. Example - Many traditional arts take a very long time to master. Among uilleann pipe (Irish bagpipe) players in Ireland and the U.S., there is an old saying that it takes, "seven years learning, seven years practicing, and seven years playing" before a person is considered a master piper. Environment/Situation - the circumstances, audience(s), time(s), and location(s) considered usual and appropriate for the display or performance of the art. Example - In some Native American tribes, traditional stories must be told only at certain times of the year, and it is considered bad luck to tell them out of season. Using images and/or an audio excerpt suggested for this activity, show the students several images of folk traditions and/or play an interview excerpt for the class in which a traditional artist talks about his or her work. Point out one example of each of the six elements of context in the images and/or excerpt. Ask students to point out other examples of the six elements of context from the Nebraska folk traditions you have displayed, ones introduced in earlier lessons, or from other traditions known to them. Continue this step until most students have had the opportunity to add an example. Hand out copies of the Venn Diagram Worksheet and instruct students to choose two types of music, dance, visual folk art, or other similar traditions from two different Nebraska cultural groups. Direct students to use the Venn diagram to show what the two types have in common and also their differences. Instruct them to pay special attention to the six elements of context in filling out the diagrams. Hold a class discussion in which students share some of the similarities and differences they identified. In closure, pose a reflection question or two to the class such as the following "Has the Nebraska environment affected these traditions? If so, how? If not, why not?" This part of Lesson 3 was focused on: 1) learning about the term context and its importance in the study of folklife and traditional arts; 2) recognizing that there are both similarities and differences between the contexts of a similar folk art from two different cultures. Students learned how to compare art forms from two different cultures, using elements of context. In the next part of the lesson, students will learn about the lifecycle of folk traditions. Explore and discuss examples of context as applied to folklife and traditional arts? Compare and contrast two similar art forms from different cultures with special emphasis on their contexts? Excerpt of audio Interview with saddlemaker Dennis Rose in his shop, the Rose Saddlery, in Arthur Nebraska. Mr. Rose had been making saddles and doing other leather work since 1976. See PDF (pending) of transcript for details. Interviewed by Gwen Meister.